Instant Help Publications, 9781626252639, 208pp. Communication is an essential life skill that every teen must learn. Based on the New Harbinger classic, Messages, this book will teach you the necessary skills--such as assertiveness, active listening, and compassion--to become an effective communicator for life. In an age of social media, texting, and ever-evolving technology, it's easy to forget how to engage in real, face-to-face communication, a critical skill for your future success As you become more connected to your smartphone and the internet, your ability to connect in person may diminish. But technology doesn't replace the need for effective communication skills. In fact, successful personal and professional relationships are dependent upon connecting with people face-to-face. Communication Skills for Teens provides the guidance you need to become a better communicator and succeed in all areas of life. You'll also learn tons of essential life skills, including active listening, assertiveness, clarifying language, the art of an apology, compassion, interviewing skills, family communication, and more. 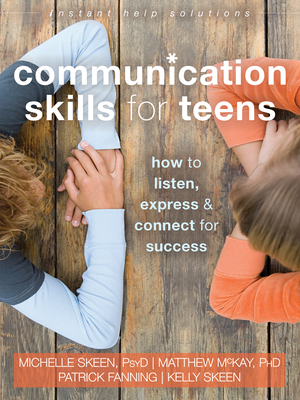 Each chapter focuses on one key aspect of communication, offers a real teen's perspective, and includes practical exercises to help you apply what you've learned in the real world--away from your computer and smartphone screens. Michelle Skeen, PsyD, is a therapist who lives and works in San Francisco, CA. She has provided brief and long-term therapy for individuals and couples by utilizing schema and mindfulness-based approaches to address interpersonal issues, weight management, anger, depression, anxiety, disabilities, and trauma. She is author of Love Me, Don't Leave Me and coauthor of Acceptance and Commitment Therapy for Interpersonal Problems. Skeen hosts a weekly radio show called Relationships 2.0 with Dr. Michelle Skeen on KCAA 1050 AM. To find out more, visit her website at www.michelleskeen.com.Matthew McKay, PhD, is a professor at the Wright Institute in Berkeley, CA. He has authored and coauthored numerous books, including The Relaxation and Stress Reduction Workbook, Self-Esteem, Thoughts and Feelings, When Anger Hurts, and ACT on Life Not on Anger. He's also penned two novels: Us and Wawona Hotel. McKay received his PhD in clinical psychology from the California School of Professional Psychology, and specializes in the cognitive behavioral treatment of anxiety and depression. He lives and works in the San Francisco Bay Area.Patrick Fanning is a professional writer in the mental health field, and founder of a men's support group in Northern California. He has authored and coauthored eight self-help books, including Self-Esteem, Thoughts and Feelings, Couple Skills, and Mind and Emotions.Kelly Skeen is a student at Georgetown University in Washington, DC.